Matchington Mansion reminds me of Homescapes, but this game has some really cool features, such as visiting other player homes to borrow their ideas, having pets and learning more about other characters that visit her dilapidated house. While it’s easy to spot 3-pillow matches, your priority should be to search for matches of 4 or more same-colored objects. Remember that you will have to complete all objectives before running out of moves and so you will need several power-ups so that you can clear a lot of pillows in fewer moves. You get power-ups, such as firecrackers, when you match four or more pillows. When the game begins, take your time to search for bigger matches and then match them quickly to get power-ups. You can start using power-ups right away or wait for that moment where two power-ups are placed next to each other. It’s your call, but I would recommend waiting for that right moment to set them off. Also, don’t forget to check which pillows you will need to clear. If, say, the game asks you to clear a certain number of red and yellow pillows, then your focus should be to get rid of them as soon as possible. Matching 4 pillows of the same color will create firecracker. You can just swap a firecracker with any pillow or double-tap it to set it off. When you set off a firecracker, it clears an entire row or column. If it’s tilted horizontally, then double-tapping it will clear the entire row. Standing firecrackers clear a column. When you have created a firecracker, don’t use it right away, you can wait for the right moment or see whether the row above/below or columns to the left and right side of the firecracker contains those pillows shown on the objective section of your game screen. Making a square match will create another firecracker, but this one explodes when you double-tap it, and clears all surrounding pillows. This single firecracker can be very useful to collect books or teddies. An L-shaped or T-Shaped match creates a big firecracker. Its blast radius is bigger than a mini-firecracker. You can use this power-up to collect lots of items, such as book or clear the required number of pillows. Matching 5 pillows in a row will create a rainbow power-up. Instead of double-tapping a rainbow power-up, you will need to swap it with a pillow to clear all pillows of that color. It can be very useful in levels that require players to clear an “X” number of pillows. You can experiment by combining two power ups. For example, swapping the firecracker with a bigger firecracker clears three columns and three rows at once. Swapping a rainbow power-up with any firecracker creates multiple firecrackers, which get scattered all over the game board and explode automatically. Swapping two bigger firecrackers results into a big explosion that clears a large part of the game board. Combining two power-ups is the best way to clear lots and lots of objects from the game board. 3. Open Gift Boxes for a Sur-Prize! Collecting stars and using them to decorate rooms fills the pink gift box bar slowly. Once you collect and use a certain number of stars, you can open the gift box. It may contain coins or boosters. For example, completing the first 12 levels will grant 12 stars, with which you open the gift box and get 500 coins. But next time, you will have to earn 25 stars and use them to unlock another gift box. If you need some home design inspiration, then just tap the star icon on the lower-left corner of the screen and press the middle button. Tap the “Visit” button to visit a random player’s home to see how he/she has decorated their home. What’s more, you could also borrow their design. 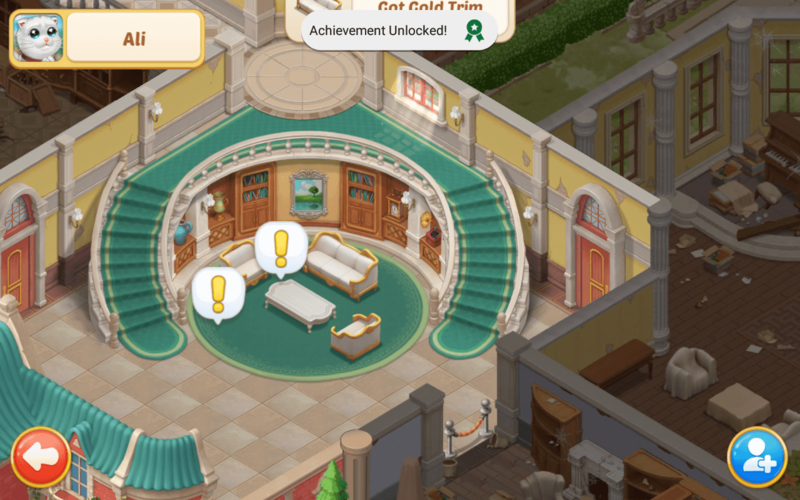 Just tap the yellow exclamation and you will get that furniture/decoration piece for your mansion. You can then come back home and tap on your furniture or decoration item to replace it with the one you just got from the random player’s mansion. 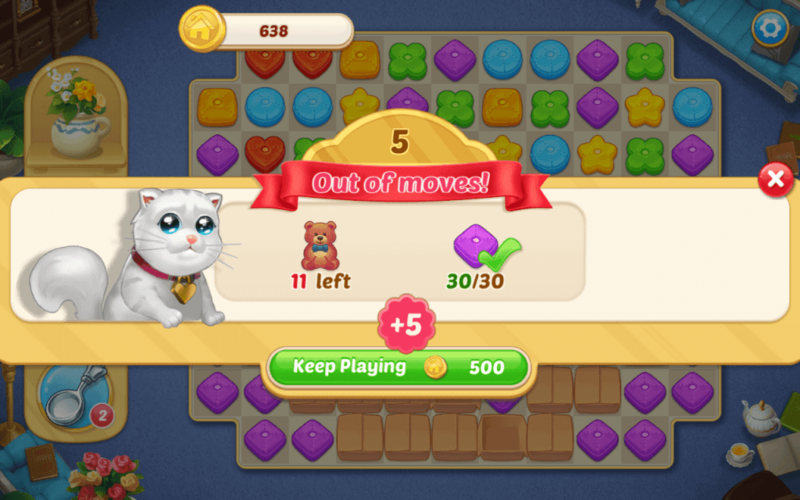 Just like most match-3 puzzle games, Matchington Mansion also lets players send and receive lives from their friends. On your home screen, tap the gear icon and then tap “connect to Facebook”. Once you do this, you can send and receive lives from your friends who are also playing the same game. 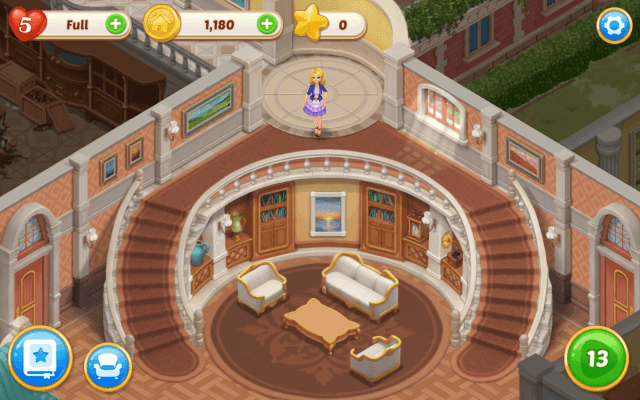 Moreover, you will also get bonus coins, which you can spend on changing design and color or your furniture. If you complete a level early with several extra moves remaining, then you are in luck as all those moves are converted into power-ups. These power-ups set off automatically, clearing several pillows all at once. 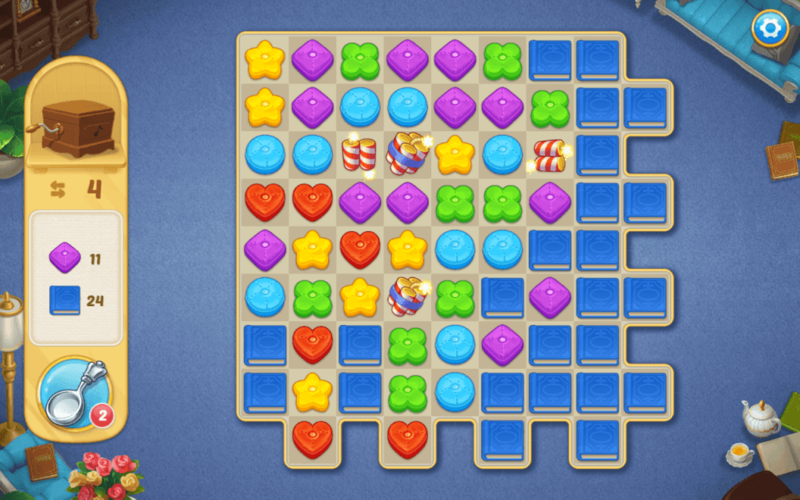 The more moves remain; the more power-ups appear on the game board and the more coins you will earn when they explode. If a move turns into a big firecracker, you will get more coins once it sets off. Since the game is based on the number of moves and not timers, you have ample time to examine the game board for big potential matches. You can easily complete a level with lots of spare moves. So you are on the verge of completing a tough level, and that one move will help you finish it. But wait – you have already run out of moves and lost a life. The good news is that the game still gives you a chance to complete that level. However, you will have to spend some coins to start off where you left off. Coins can be very helpful in turning a failed level into a winner, so save coins for such hard-to-beat levels. Every time you finish a level, you get coins as rewards. Bonus moves also convert into coins. You can use them to change a décor or color, but try to save coins for completing hard levels.